The Japanese yen has peaked against the dollar. The dollar in fact elected a YEARLY Bullish Reversal at the end of 2014. This is yet another confirmation that we are facing a strong dollar ahead, ushering in this age of DEFLATION, which should start to hit in the USA after October. This is impacting everything, not the least of which has been commodities and interest rates as hoarding cash rises. The commodity bulls keep touting China from every angle since their consumption reached almost 50% in 2011 of total world output. China’s economy entered a recession with 2007, and despite the recent reaction stock rally, we are also witnessing investment outflows from China. Massive borrowing in Hong Kong and taking cash back to China has masked the trade flows hiding the real trend because people just look at money and not actual trade. As the dollar rises, this helps to extend the deflationary trend in commodities, and places pressure on their dollar foreign loans. No degree of austerity by the ECB will reverse the economic decline in Europe. Socialism has reduced Europe from a major economic power to a shadow of its former self. The bulk of the money supply today is DEBT, not actual currency. Artificial manipulation to inspire austerity fuels deflation and will never achieve a reduction in inflation that Germany is so terrified of these days. The idea of creating money is only the old school concept of monetary inflation, whereas today the bulk of money creation is actually debt. This is not something that can be PAID off; the only outcome is default. 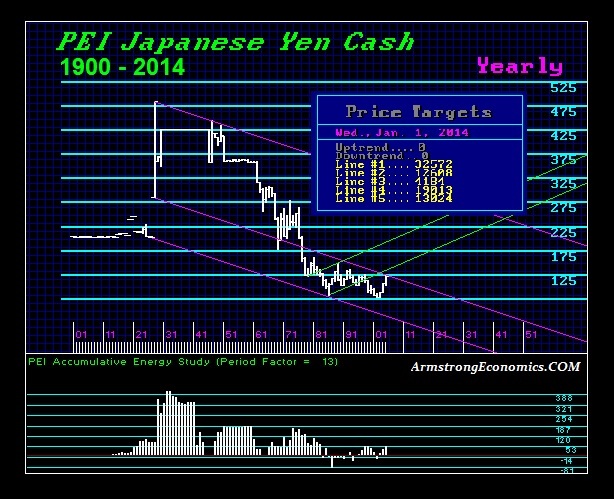 The global deflationary trend is thus alive and well, as we can see reflected in even the Japanese yen. Those who keep touting the hyperinflation scenarios and the collapse of the dollar only looking at the United States are blind to the global trend. The dollar has elected a YEARLY BULLISH REVERSAL against the Japanese yen, confirming the dollar rally, the continued deflation, and additional signals this year that will confirm this trend into 2016.